Your nose: is it too large, too small, too flat, and too pointed? Is it crooked? Do you have trouble breathing from one or both sides of your nose? If so, you are in good company. Many people feel their nose detracts from their whole face, taking away from the natural beauty of their eyes, hair or other facial features. That’s why they choose to get a rhinoplasty. Rhinoplasty surgery can change the shape of the whole nose or of just a small part, making it fit more harmoniously with the rest of the face. 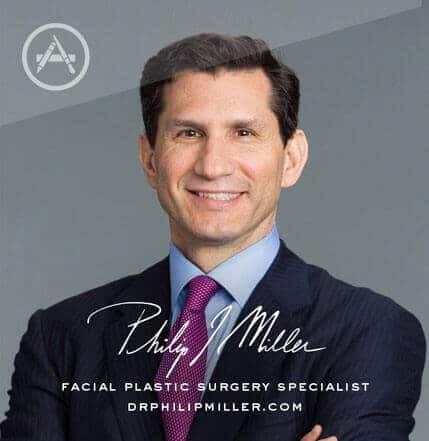 Dr. Miller in Manhattan is skilled in making these changes while preserving, or if need be enhancing, the function of the nose so that breathing is free and comfortable. Careful and extensive preoperative discussions and planning will take place before your surgery. We will consider the prominence of your cheeks, your jawline, your skin thickness and quality, and the overall dimensions of your nose before advising you of how not only to achieve the changes you want, but also to achieve overall harmony of all your facial features. Dr. Miller can improve features in your current nose that detract from your overall facial aesthetics. If your breathing is a problem, Dr. Miller will conduct a detailed examination and advise you as to how this can be improved with surgery. Sometimes, special tests to measure your degree of obstruction or to evaluate your sinuses may be required. If you suffer from sinus problems, these can be improved at the same time as nasal surgery. Rhinoplasty is one of the most popular cosmetic surgery procedures, but not everyone is an appropriate candidate. As with any elective surgery, patients should be in good physical health and have realistic expectations for improvement. If you are in good health and looking to improve the shape of your nose, you may very well be a good candidate for rhinoplasty. Some patients seek rhinoplasty to improve an inherited characteristic such as a bump on the nose or to address deformities or breathing complications related to a nasal fracture. It’s important to define what open rhinoplasty and closed rhinoplasty are. Closed rhinoplasty, also referred to as endonasal rhinoplasty, is a rhinoplasty procedure in which all incisions are confined to the inside of the nostrils, resulting in no visible skin incisions. Once the incisions are made, the skin is lifted from the underlying cartilage and bone and the nose is then recontoured and reconstructed. For open rhinoplasty, also referred to as external rhinoplasty, a very small incision is made between the nostrils on the underside of the nose. This allows the tip of the nose to be opened in order to reveal the structures of the lower and middle third of the nose. Since all incisions are inside the nostril, no external evidence of the nose job can be identified. It also means that a patient does not have to deal with external stitches during the recovery phase. Since the skin bridge between the tip of the nose and the lip remains intact throughout a closed rhinoplasty, the flow of blood and fluid accumulation is unimpaired. Consequently, the swelling can drain more easily and patients enjoy a shorter recovery period. Since all nasal access is through a tiny interior incision, the surgeon must be highly skilled and experienced in limited-visibility surgical procedures. Closed rhinoplasty is ideal for modifications such as minor tip and bone changes, but procedures which require more complicated and delicate steps may not be able to be performed with the limited access and exposure afforded by the closed technique. So, which is better? Some surgeons strongly believe that the external incision for open rhinoplasty is not necessary for a primary, or first time, rhinoplasty procedures. Instead, they think that open rhinoplasty should only be performed for revision cases that are significantly difficult. Other surgeons, however, perform open rhinoplasty on both primary and revision rhinoplasty procedures. Both groups may be right. The appropriate approach – be it open or closed – really depends upon the complexity and difficulty of the particular patient’s nose as well as the surgeon’s level of experience and skill. Some surgeons who are very skilled at open rhinoplasty, favor this approach for most cases and achieve excellent results. Other surgeons favor closed rhinoplasty and are able to achieve excellent results with this approach. When determining which approach is right for you, it’s important to focus on your satisfaction with the surgical result. Most patients would prefer the procedure that results in no visible scarring, but it’s important that you not select your surgeon solely because he or she favors one approach over another. The emphasis should not be on whether or not you have a resultant scar but on the whole of the surgical result. After all, the incision required for open rhinoplasty is a small one on the underside of the nose that typically heals into a nearly invisible, fine-line scar. It’s certainly a small price to pay, if necessary, for a harmonious and natural appearing nose. If you are still unsure which procedure is right for you, visit medlineplus.gov. The consultation is an excellent time to discuss the rhinoplasty surgery and whether or not it is right for you. Dr. Miller will examine and assess your nose and how it relates to your other facial features, as well as the thickness and quality of your skin. He will also review your medical history and overall health. 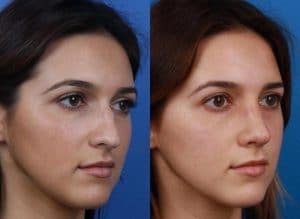 All details of the procedure will be reviewed, including the available options and rhinoplasty techniques, the facility, the anesthesia, the recovery, the risks and benefits, and the costs. 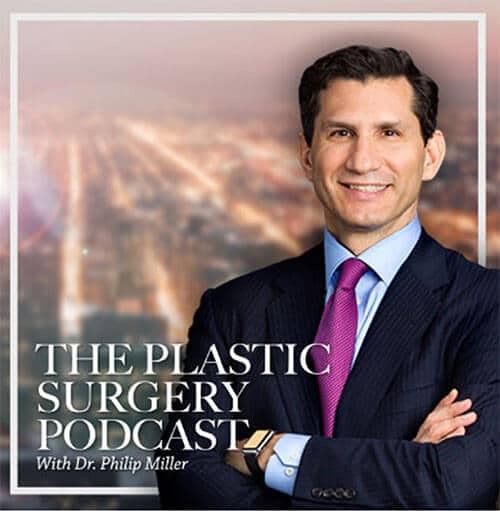 The consultation, at his New York City office, is an excellent time to discuss your expectations and concerns for surgery and address any questions that you may have. Computer imaging may also be used to help give you an idea of the changes that can be made to your nose and what you can expect from surgery. Together, you and Dr. Miller can come up with a realistic goal for surgery. Cosmetic or functional surgery of the nose usually takes 1½ hours to 2½ hours and may be done either with you asleep under general anesthesia or awake under sedation. Most incisions are placed inside the nostrils, but in some cases, a small incision may be made in the natural creases along the sides or near the base of the nose. These heal quickly and leave scars that are nearly invisible. At the end of the operation, a cast will be placed on your nose. If there is any bleeding, a light dressing may be placed inside the nostrils and removed the same day or the next day. If any sutures were placed in a natural crease, they are removed in several days. The cast is usually removed in one week. Most people are amazed by how little pain there is after rhinoplasty surgery. The most uncomfortable part of the recovery is the inability to breathe through the nose for several days due to swelling. This usually improves within one or two weeks. Expect some swelling around your eyes for several weeks. As the swelling subsides, you will start to see the improvements from your surgery. A few special precautions are required during your recovery. Bending or lifting can prolong swelling, so this is not recommended for three weeks after surgery. Running, cycling or aerobics should not resume for three weeks. Contact sports should be avoided for six weeks, as it takes that long for the bones to fully heal. You may drive when the swelling subsides enough not to interfere with vision, and you may fly two to three weeks after surgery. While every risk cannot be eliminated, there are some things you can do to minimize certain risks. For a more thorough list of post-operative guidelines, please read our post-operative rhinoplasty instructions. Your new nose will be in a protective cast for the first week. It goes without saying that once the cast is removed, you should take great care to guard your nose against any trauma or impact. It takes 3-6 weeks to fully recover from a nose job. Even when you’re feeling better during this time, you should avoid strenuous activity or anything that presents a risk to your new nose. Q: What are some of the risks associated with rhinoplasty surgery? A: Bleeding, Infection, nasal obstruction, undesired result. Speak to your rhinoplasty surgeon specifically about these complications and how they can occur. 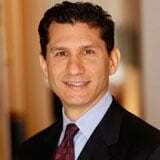 Q: What should I ask my surgeon before my rhinoplasty procedure? And how can I prepare myself prior to the surgery? How many rhinoplasties do you do a year? Will you make any incisions on the outside of my nose? Do you pack my nose and for how long? When is the cast removed? Wear clothing that fastens in the front or back. Avoid slipover sweaters, T-shirts, and turtlenecks. Do not eat or drink anything, including water, the morning of your surgery. Leave your valuables at home; do not wear jewelry. Do not wear any facial or eye make-up, or nail polish. You may wear your glasses; do not wear contact lenses. If you wear dentures, keep them in. Q: How much does the procedure cost? Is it different at a clinic vs. a hospital? A: Depending on the reasons for having rhinoplasty, it can be covered by insurance. If the reason is purely cosmetic, then it is not. However, if it is performed in order to correct breathing issues, then it may be covered by your insurance policy.